Ban Pae Kwang Moo3, Nam Prae, Hang Dong, Chiang Mai. There is garbage management, The garbage market reduces haze. Trying to raise awareness among the descendants in the community to manage waste, reduce burn. And the community's ongoing waste management budget. The multipurpose Hall on the 5th of every month. Let the community volunteer staff scale. And buy garbage from the villagers. The junk market starts with a village project, reducing the burns, every noon to two afternoons is burned time. Later, there was the junk market so no people burned Become a village to reduce the burn by default. Finally won the Outstanding Environment Award by Ministry of Natural Resources and Environment. Then we pulled the youth to help us. At least from continuation to generation. 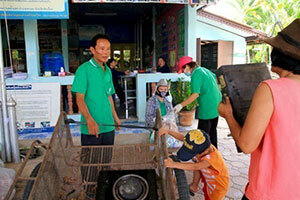 Make the garbage in Ban Pae Kwang area to prototype community. Letting children take care of their garbage is a sustained care from generation to generation. Ban Pae Kwang Junk Market Project. Do not focus on profit. The villagers are volunteering to help. Because they think that if there is a wage. The project is weak immediately. So do it together. The money is a scholarship to the youth people, help the elderly people, disadvantaged people in the village. Now the money from the prize and the money from the garbage can buy a pickup truck. The money was bought the happiness for people in the community. Because even if the community has a fund of ten million, but not help the villagers, it is useless. Pailin said This project started by the community. Not government If the government supports the concept of community as a model. Believe that garbage problem And the Chiang Mai fog is gone.